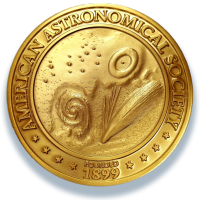 Arpita Roy was recently awarded the American Astronomical Society Rodger Doxsey Travel Prize and the Penn State Alumni Association Dissertation Award. Both were awarded based on the excellence of her PhD dissertation research, “The Promise of Many Worlds: Detection and Characterization of Exoplanets with Extreme Precision Spectroscopy.” Arpita‘s work focuses on developing instrumentation and data analysis pipelines for high precise radial-velocity spectrographs to detect and characterize low-mass extra-solar planets and distinguish them from false positives. Kimberley M. S. Cartier has won the Chambliss Graduate Student Poster Medal which recognizes exemplary research by undergraduate and graduate students. Kimberley’s winning poster summarizes a chapter of her thesis, and discusses applications of science communication theory to the practice of astronomy communication across media and audiences. Not coincidentally, she has also written about best practices for poster design on her blog.